Sailing Barcelona offers a variety of sailing trips for our guests to choose from, ranging from private tours for 2 to 8 people from €215 or open group tours at €50 per person. 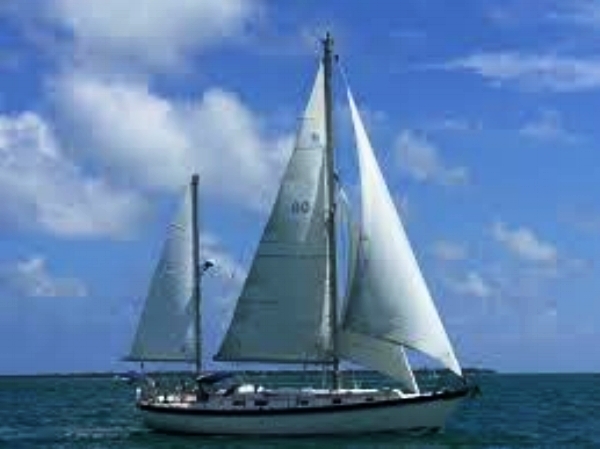 You will sail on a classic British Rival 38 with a qualified and experienced RYA/MCA skipper. We offer sailing trips during the morning, afternoon and evening when given enough daylight through the summer months. The mornings are great if you also wish to jump off for a swim in the sea as the conditions are generally calmer. The afternoons provide us with a local thermal wind ensuring fantastic sailing conditions under full sails. The sunset trips are quite spectacular as the sunsets over the Barcelona skyline. Get in touch to personalize your own sailing trip! Sailing Barcelona offers everyone the opportunity to live the enriching experience of sailing with professionally qualified RYA skippers, on either a classic design British built boat which is the Rival 38 or the American ketch rigged Pearson 424 for boat tours containing 9, 10 or 11 people. We can participate in the handling of the boat and learn or improve our skills. Everyone can take a turn at the helm to steer the boat after hoisting and trimming the sails, under guided instruction from our professionally qualified skippers. Or simply take the opportunity to just relax on the teak deck and sunbathe with a cool drink. Enjoy our sunny Mediterranean weather whilst becoming conscious of the importance to preserve our maritime environment. We generally run two and a half hour sailing trips on a daily basis to cater for private cruises and individual requests. Our first trip is in the morning and is a great time to get into the sea before the yachts leave the port with their own sailing trips. It is also a great time if conditions are right to go for a swim in the Mediterranean as the sea is generally calmer at this time. Our afternoon sailing trip takes the best advantage our the local conditions, by utilizing the frequent south winds from the Garbi thermal, especially during the summer months. This second boat tour has the potential to give those with a good degree of sailing experience a chance to really get a feel for the boat behind the helm. Our last private sailing trip of the day is the sunset sailing trip, perfect for the romantics and a relaxing respite from the hustle and bustle of the city. If you have any special requests prior to booking feel free to be in touch with us, as we would be happy to discuss with you your perfect sailing trip. For larger groups also please get in contact with us initially so that we can organize your your trip in the best possible way.